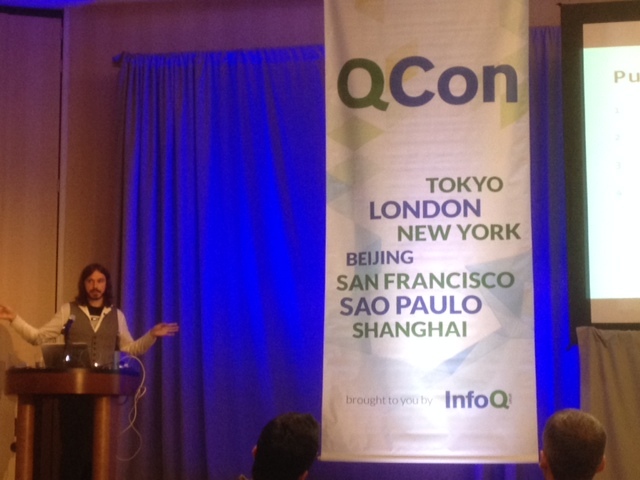 Today I attended a talk 'How Facebook Scales Big Data Systems' at QCon NY 2014. It turns out that Jeff Johnson took this opportunity to announce a new project by Facebook: Apollo. The following is a rough transcript of the talk. Apollo is a system Facebook has been working on for about a year in their New York office. The tagline of Apollo is 'consistency at scale'. Its design is heavily influenced by their experience with HBase. Facebook generally favors CP systems. They have four datacenters using master/slave style replication. Missing the 'A'vailability usually isn't a big deal within a datacenter, but across DCs it becomes troublesome. So the question really boils down to: can we layer AP on top of CP? The shards use Paxos style quorum protocols (CP). Raft is used for consensus. Fun sidenote: this turned out to be not much simpler than multi-paxos, even though that was the expectation. The apparent sweetspot for Apollo is online, low-latency storage of aforementioned data structures. Especially where atomic transformations of these data structures are required. The size of 'records' should range from a byte to about a megabyte. Every operation on the Apollo api is atomic. For exampe, you can pass in conditions into a read/write call. As an example, a condition can assert that a map contains a certain key. The operation will only go through if the condition (atomically) holds. 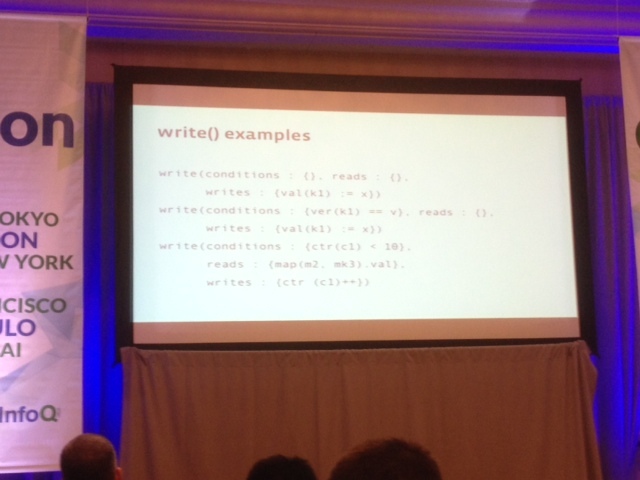 First write call mimics a traditional last-write wins KV store. Second one does optimistic concurrency, last one allows for complex transactional behavior. Note that a write can also return (consistent) reads! The idea is that Apollo provides CP locally and AP between remote sites. In addition to just storing and querying data, Apollo has another unique feature: it allows execution of user submitted code in the form of state machines. These fault tolerant state machines are primarily used for Apollo's internal implementation. E.g. 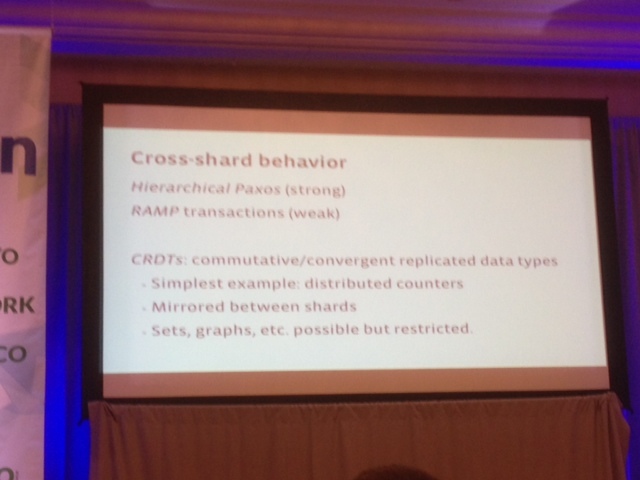 to do shard creation/destruction, load balancing, data migration, coordinating cross-shard transactions. But users can submit FTSMs too. These are persistently stored, so it tolerates node failures. A shard owns a FTSM. A state machine may have side effects (e.g. call an external API), but all state changes are submitted through the shard replication mechanism. The exact way to create these FTSMs were not discussed. Furthermore it powers TACO, an in-memory version of their TAO graph. It supports billions of reads per second and millions of writes this way. A more persistent application of Apollo is to provide reliable queues, for example to manage the push notifications. This was a quick write-up, twenty minutes after the talk ended. Any factual errors are solely caused by me misinterpreting or mishearing stuff. I expect more information to trickle out of Facebook engineering soon. That said, I hope this post paints an adequate initial picture of Facebook's Apollo!